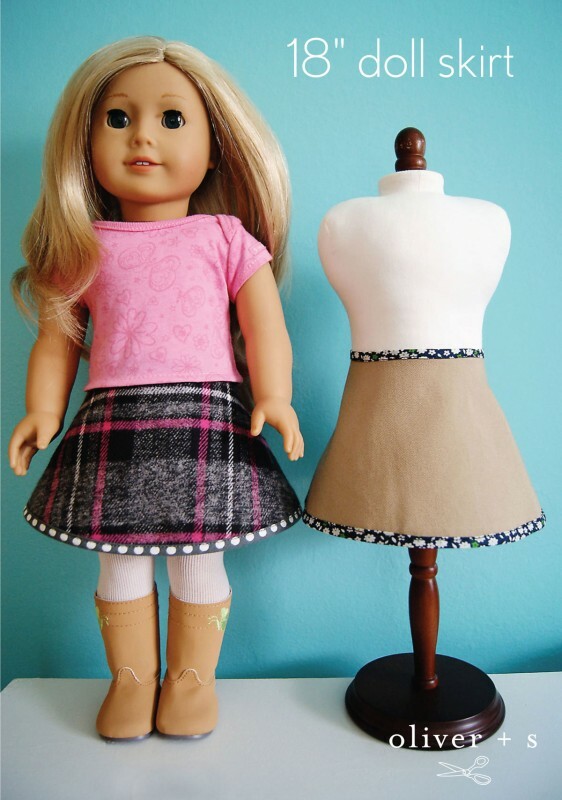 Our friend Rachel is back with a fun little doll skirt project that can be made from an Oliver + S pattern. This sewing project could be fun to make together with your daughter or granddaughter. And who doesn’t love sewing patterns that serve more than one purpose? You might be surprised which of our patterns Rachel used for this cute little skirt! Thanks so much, Rachel! This doll skirt happened by accident. Let me give you a little bit of background and tell you the story. We have an 18-inch doll dress form and we have fun together designing different outfits by pinning fabric to it. One day, from her fabric stash we grabbed the abandoned brim piece from the failed bucket hat and wrapped it around the waist to make a skirt. And you know what? It looked like the perfect little skirt! It just needed finished edges and a closure. So that is how this skirt came to be. It is a super quick and easy project that uses only a small amount of supplies. Here’s how you can make your own 18-inch doll modified circle skirt with bias trim and Velcro closure all the way down the back. And it can be made to be reversible! The pattern comes from the reversible bucket hat (a free downloadable pattern) which is from the Oliver + S Little Things to Sew book. You will need the bucket hat brim, size Large (pattern piece 7a): print out pages 5 and 6, tape them together, and cut out size Large. 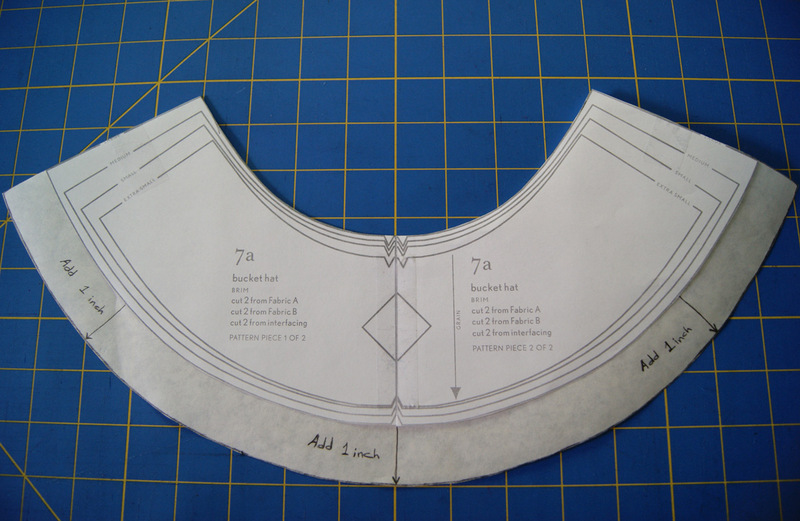 Place this pattern piece on top of a larger piece of paper, trace it, and add one inch to the bottom. Now you have your new pattern for the doll skirt. Cut the skirt out of fabric, sew bias tape on all the edges, and then sew on the Velcro. I sewed on bias tape on the two side edges first, then on the waist and bottom edges. But if you are skilled at sewing bias tape around corners, go ahead and sew one continuous bias tape around the whole skirt. 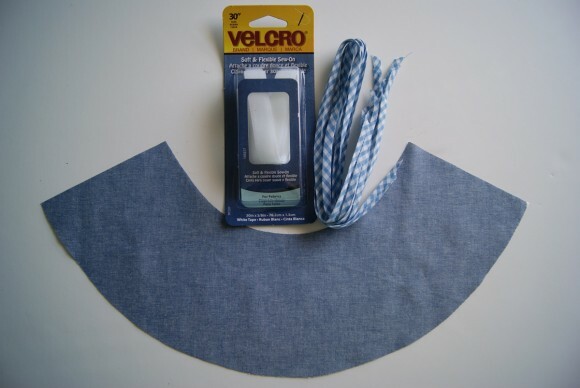 Place the Velcro strips right up to the edges of the skirt and sew around all four edges to secure it nicely. To make the skirt reversible, just take two cut out skirts, put wrong sides together and finish by following the rest of the steps. You can buy pre-made bias tape, but the choices are limited (mostly solid colors). In order to have more variety and something more fun, make your own bias tape. When you make your own the options are limitless. I used a 1/2 inch bias tape maker, but a 3/4 inch bias tape maker or a 1 inch bias tape maker could be used as well. For help with all things bias tape, here are tutorials from the Oliver + S blog. You could easily get two skirts out of a quarter yard of fabric or a fat quarter, but you probably already have enough fabric from scraps in your stash to make at least one. Maybe you have some fabric left over from a clothing item you sewed that special girl in your life, so now she can match with her doll. 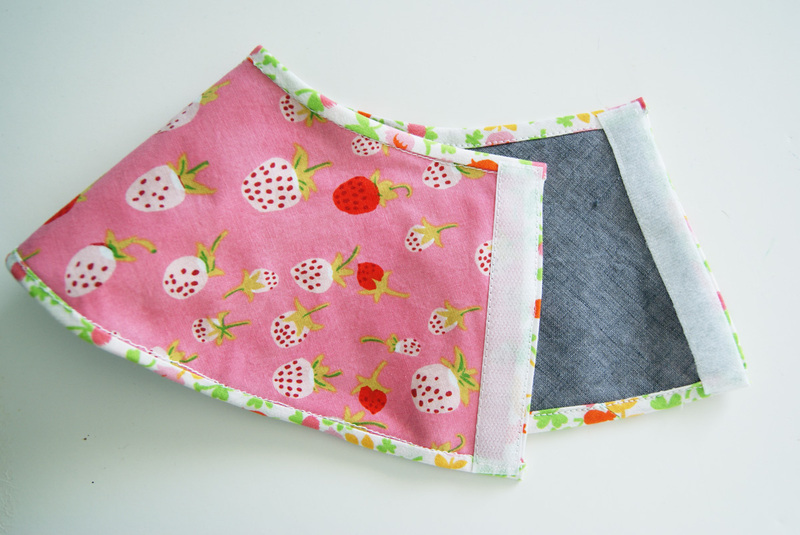 Enjoy this instant gratification sewing project. Let this be a starting point. Have fun customizing and changing it up a bit. Also don’t worry about perfect sewing as this is just a doll skirt. I’m sure the doll won’t even notice! If you are looking for additional 18-inch doll clothing sewing projects, be sure to check out the Popover Sundress (free downloadable pattern) and the Tea Party doll dress (which is a miniature version of the Tea Party Sundress) in the Oliver + S Little Things to Sew book. So clever! I have been sizing down the O+S dresses down to fit a waldorf dolly but this is easy peasy, thanks! Fun!!! I hope you continue to share what you do with Doll Clothes! Thanks so much for this, my 8 year old daughter has a few birthday parties to go to in the next few weeks, and these will make the perfect birthday presents! Love this! If you wanted to make an even easier reversible version, you could skip the bias tape and just sew the two skirt pieces together, right sides together, leaving an opening for turning it right-side-out. You wouldn’t have the pretty edge, but it would be double-sided and hemmed all-in-one. Great Idea! I have a doll too, so I will have a few new easy skirts! This is brilliant! Well done Rachel. I know some little girls over here who would flip for these. Where did you get that adorable dress form? To die for…so cute. Love these. My daughters will probably want to sew one this weekend. We make Lazy Days skirts for their 18 inch dolls all the time – it’s the perfect playdate sewing activity and their friends go home amazed that they just made a real skirt for their doll “just like from a store”. We also once adapted the tutu in Little Things to Sew for the doll and that is one of my favorite projects ever. It looks so cute and has outlasted many a store bought doll outfit! Does this skirt fit American Girl dolls? I just tried wrapping the pattern around my niece’s doll and it didn’t meet at the back. Should I just add at the side seams to make it fit her doll? This is great…..BUT I cut it out Large and it is not big enough to go around the 12 inch waist of the 18 inch doll. Am I wrong? I got frustrated and am still working on it. Thanks. Also , for us only 1 year into sewing, the bias tape direction did not make sense. I usually just cut strips of fabric along the bias and turn them in half. Another simple way to make this is to make your own pattern! You can also use another scrap of fabric to connect the back. If I wanted to add a ruffle to the bottom of the reversible 18″ doll skirt (say for a cowgirl skirt), what formula would I use to determine how long the fabric piece should be (before it’s gathered) in relation to the bottom width of the skirt? Thanks for your help. I have the hardest time sewing Velcro on — any suggestions? I even switched to a heavier needle. Look for soft velcro next to the regular stuff. 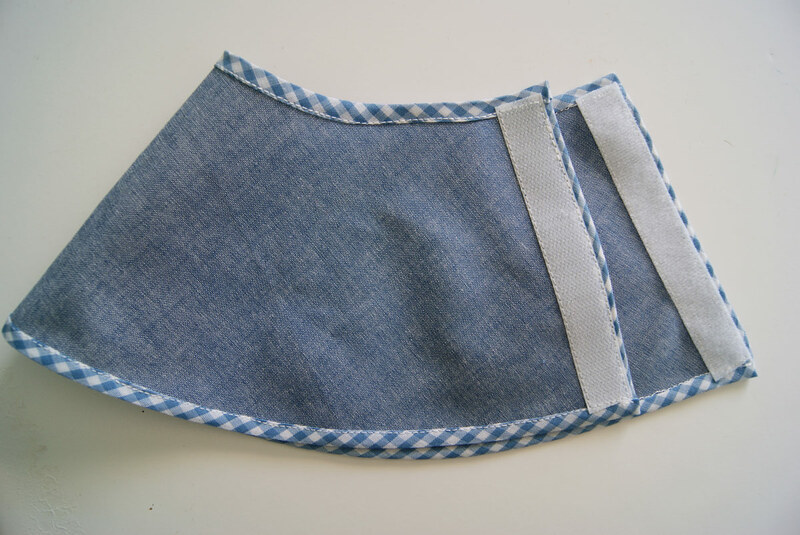 Then sew as close to the edges as you can – see how it has a little strip that doesn’t have the stiff stuff there. It is much easier to pull apart too which is easier on the kids and the doll clothes. I have a boatload of 18’doll clothes patterns. Is it possible to reduce them to fit my 14-1/2″ Wellie wisher? Joanne, you’re in luck! 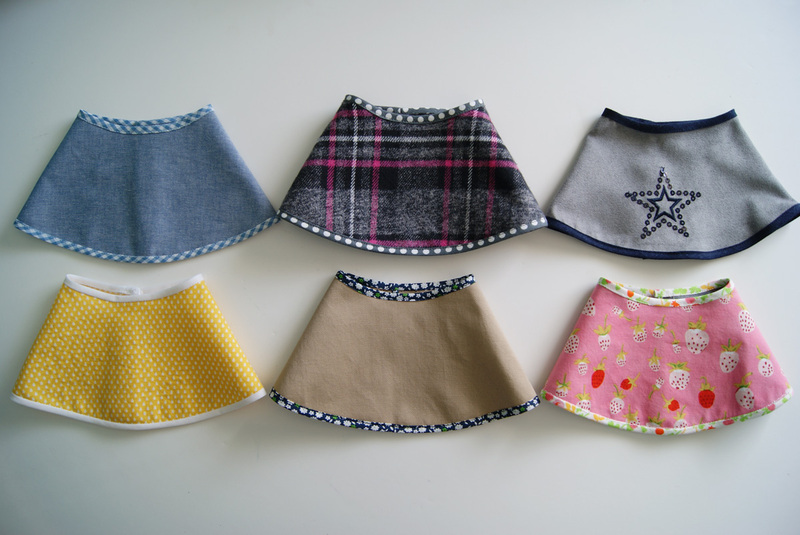 We have a free 14.5″ doll skirt https://oliverands.com/community/blog/2016/11/free-pattern-for-13-and-14-5-inch-doll-skirts.html Happy sewing!